A 33-year-old Japanese man experienced intermittent severe epigastralgia 5 days before admission followed by dyspnoea and fever, and he was hospitalised in acute respiratory failure. He had taken no medications before admission. Bilateral ground-glass opacities were seen on the chest radiograph on admission. The patient received BCG in childhood and had no history of atopy, asthma or any allergies, and did not smoke. On examination, his body temperature was 38.3°C, and oxygen saturation on air was 88%. Mild fine inspiratory crackles were detected by chest auscultation. There were no signs of urticarial rash or angioedema. He had epigastric tenderness without signs of peritoneal irritation. Laboratory tests revealed the following: white blood cell count, 1.26×109/l; proportion of peripheral eosinophils, 2.3% (normal <7.0%); C-reactive protein, 13.6 mg/dl (normal <0.3 mg/dl); amylase, 120 IU/l; immunoglobulin E, 456 IU/ml (normal <170 IU/ml); and Aspergillus precipitins and antinuclear cytoplasmic antibody (ANCA) were negative. Arterial blood gas analysis on air showed a pH of 7.40, Paco2 of 4.68 kPa (35 mm Hg) and Pao2 of 7.51 kPa (56 mm Hg). High-resolution CT revealed bilateral non-segmental ground-glass opacities that were distributed dominantly in peripheral lesions. Interlobular septal thickening was also noted (figure 1A,B). Chest high-resolution CT on admission revealed bilateral non-segmental ground-glass opacities and interlobular septal thickenings. (A) Right upper lobe view; (B) left lower lobe view. We performed immediate bronchoalveolar lavage and transbronchial lung biopsy. Severe epigastralgia occurred immediately following the bronchoscopy, so abdominal CT and oesophagogastroduodenoscopy were performed (figure 2). No abnormities were observed on abdominal CT. 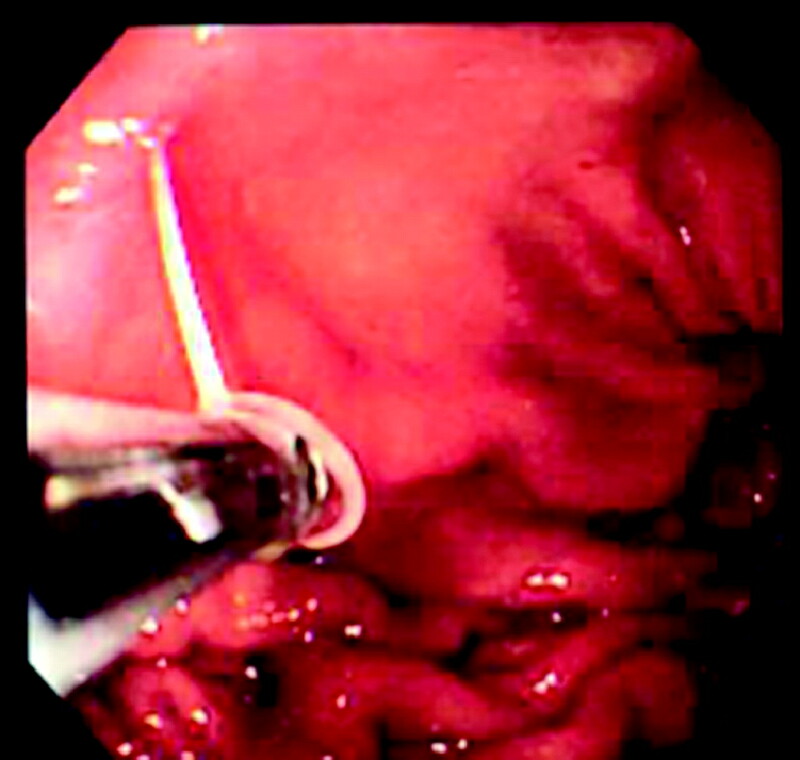 Image from oesophagogastroduodenoscopy at the gastric corpus. What is the cause of the pulmonary infiltrates and respiratory failure? What are the underlying cause and significance of the intermittent severe epigastralgia? What diagnostic test can confirm the diagnosis? Analysis of bronchoalveolar lavage from the right B5a segment revealed a total cell count increase of 7.8×105/ml with 50% eosinophils. No bacteria or tubercle bacilli were detected in the bronchoalveolar lavage fluid. Eosinophilic infiltration with degranulation and fibrin was seen in the transbronchial lung biopsy specimen (figure 1A,B). These histopathological findings are consistent with eosinophilic pneumonia (EP). Histopathological findings of transbronchial lung biopsy. Eosinophilic infiltration (arrows) and fibrin depositions (arrowheads) are seen. (A) ×20 magnification; (B) ×40 magnification. Oesophagogastroduodenoscopy revealed an Anisakis simplex on the gastric body mucosa. 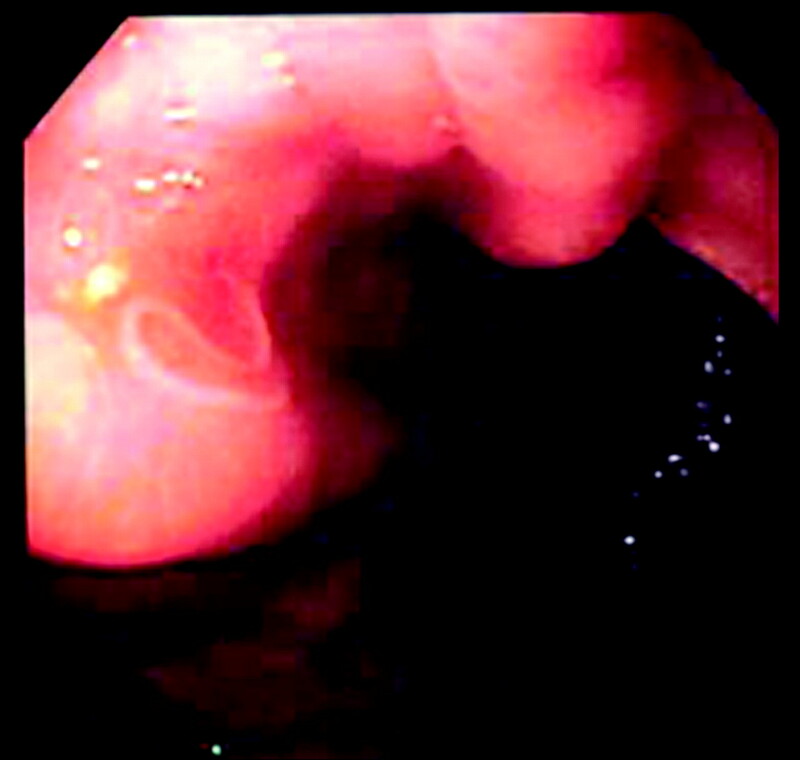 After removal of the parasite with endoscopic biopsy forceps (figure 2), the patient's severe epigastralgia, dyspnoea, cough, fever and respiratory failure improved almost immediately without steroid treatment. Radiographic abnormalities improved remarkably at 3 days after removal of the Anisakis. Because improvement of the patient's EP occurred only after removal of the Anisakis, our ultimate diagnosis was EP due to gastric anisakiasis. Oesophagogastroduodenoscopy revealed an Anisakis at the gastric corpus. The Anisakis was removed with endoscopic biopsy forceps. Our patient frequently ate raw seafood such as squid and saba (mackerel) before admission and was positive for the A simplex antibody by radioallergosorbent test. Therefore, we thought this to be a case of fulminant-type gastric anisakiasis with sensitisation and Arthus-type hypersensitivity reaction. Such allergic reactions might possibly cause EP.
. Parasitic pulmonary eosinophilia. Semin Respir Crit Care Med 2006;27:171–84.
. Anisakis simplex: from obscure infectious worm to inducer of immune hypersensitivity. Clin Microbiol Rev 2008;21:360–79.
. A case report of serologically diagnosed pulmonary anisakiasis with pleural effusion and multiple lesions. Am J Trop Med Hyg 1994;51:819–22.
. Probable pulmonary anisakiasis accompanying pleural effusion. Am J Trop Med Hyg 1985;34:310–13.
. Pulmonary anisakiasis presenting as eosinophilic pleural effusion. Respirology 2005;10:261–2.